GOOD SALT: WE NEED YOU! We all know that salt is naturally occurring, but many don’t realize that it is also an essential part of the human make up. It helps carry nutrients in and out of our cells, hence: we crave it, we need it to survive, it serves us! Yet it is another key ingredient that man has messed with and destroyed. As such, salt often gets a bad rep, with many opting for “low-salt diets” and salt substitutes, which are totally depriving people of the (good) salt we need! It’s time to set the record straight on what sort of salt we should be eating and learn about how good salt really is for our well-being. Having eaten salt for thousands of years it is very familiar to our human geneology. There is substantial evidence that the earliest humans were mainly coastal dwellers who ate large amounts of naturally salty seafood. Following these years, and before refrigeration, we used to preserve meat, dairy and vegetables for storage and transport. Salt is a major component of our blood plasma, lymphatic fluid, extracellular fluid, and even amniotic fluid, so it’s no wonder our taste buds have receptors to specifically identify salty things so we can consume and benefit from them. Wise old Homer spoke of salt as a divine substance and Plato referred to it as dear to the Gods… so why are we getting sick from salt consumption and being told to eat a low salt diet? Basically, the table salt we all know has nothing in common with the natural salt our bodies were designed for and have consumed for centuries. Table salt has been chemically cleaned and treated so it can be mass-produced and used to cheaply preserve packaged and canned foods. This purification process basically heats the life out of the salt, destroying its chemical structure and all the essential trace elements and minerals we love and need. What is left is an inorganic form of sodium chloride to which anticaking agents and moisture absorbents (like gross calcium carbonate, magnesium carbonate and hideous aluminium hydroxide) are added to improve the salt’s pouring ability. Our bodies see this form of salt as foreign, which means it takes us loads of energy to process: in dealing with it we lose essential minerals like potassium, calcium, magnesium, copper, zinc, manganese… totally the opposite of what is meant to happen when we consume salt! The unnatural sodium chloride takes water from our cells creating water retention and inflammation which in turn causes things like cellulite, joint pain, arthritis and gout. Our kidneys and gall bladder are then put under major stress to deal with the excess harmful acids. Delightful huh? As if I haven’t stressed it enough: ditch the processed table salt! Go for awesome natural salt! 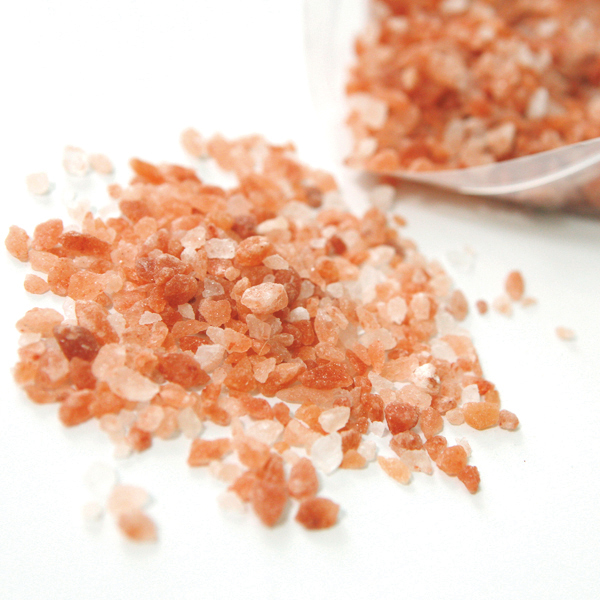 Himalayan crystal salt, mineral salt and sea salt are jam packed full of goodness! Vital nervous system support – sodium and chloride ions play an important role in the firing of the nervous system neurons. This means salt is essential in helping our brain communicate with our muscles so that we can elicit all of our physiological reactions and move on demand via sodium-potassium ion exchange. Metabolism & digestion – sodium is involved in the manufacture of bile, which helps break down fats so that they can be absorbed. Salt is also rich in chloride which stimulates hydrochloric acid which helps kill bad bacteria and denature the proteins in our food so they can be more easily used up. Adrenals…. fight or flight support – our adrenal glands are in charge of releasing and regulating over 50 hormones, including hormones that regulate blood pressure, glucose levels, mineral metabolism and stress response. The adrenal glands are sodium dependant when it comes to producing these hormones – especially those needed to keep the body’s metabolism running smoothly. Craving salt is a sign of poor adrenal function. During periods of stress or when fatigue levels of aldosterone drop (adrenal hormone that helps regulate blood pressure) so the body responds by craving salt to help stabilize blood pressure.